The Colonial-era Old Swedes Inn in sleepy Swedesboro (that would be Exit 2 of the NJ Turnpike) has been deliciously brought into the 21st century under Philly star chef Terence Feury (Striped Bass, Fork). Here’s my review, from the May issue of New Jersey Monthly. Duck breast with red cabbage, caramelized turnip, and red-wine fig emulsion from Blu, Montclair: chef Zod Arifai. Rosie will also dish about the NJ restaurant scene. 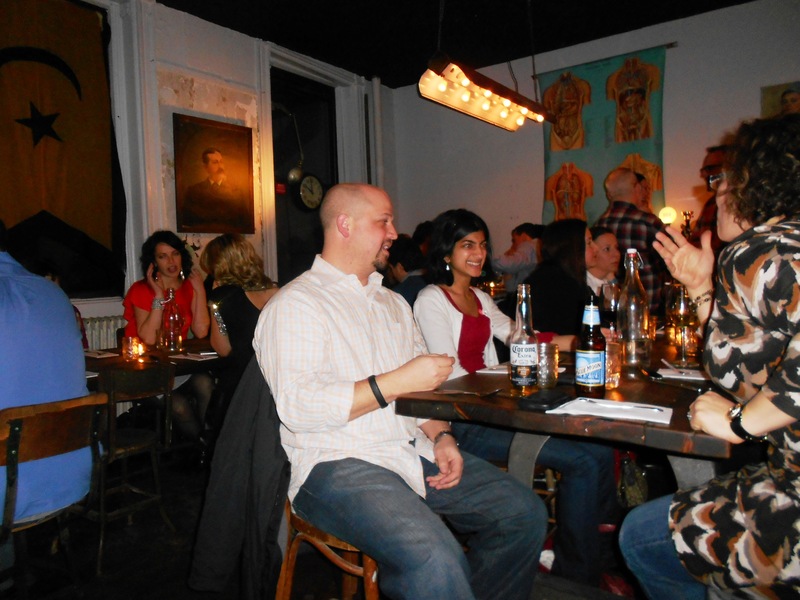 Bring your questions and bring your appetite for a fun-filled evening. 6:30 to 9:30 PM; $65. Click here to register, or call 973-258-4009. When I trekked down to NoLIta for a Hurricane Sandy benefit dinner recently, my main motivation was to connect with my friend Ruth Alegria, who was up from Mexico City taking time away from the food tours and cooking classes she conducts through her business, Mexico Soul and Essence. 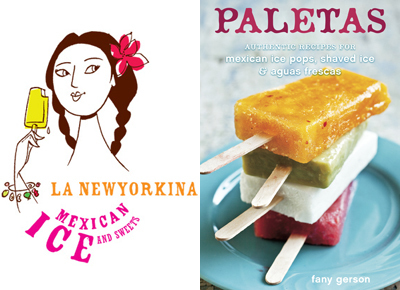 My second motivation was to help Fany Gerson, a young New Yorker whose La Newyorkina all-natural ice pops with Mexican flavors – paletas – had been hugely successful. Until, that is, she lost her Red Hook kitchen – equipment, supplies, inventory, everything – to the storm. What I wasn’t expecting from the evening was (a) an introduction to one of the coolest dining spaces in the city and (b) a Mexican meal as good as any I’ve had in, well, Mexico itself. 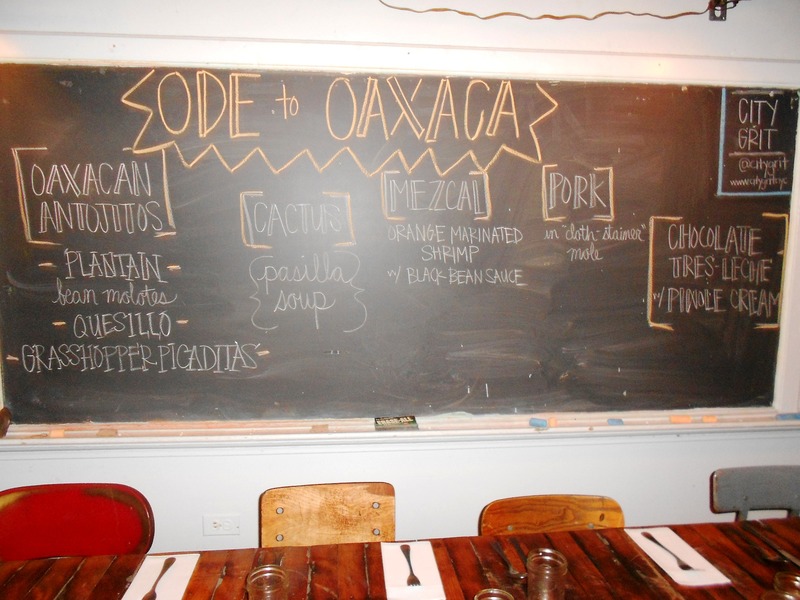 Fany’s Ode to Oaxaca – she was raised in Mexico, where she had a beloved nanny from Oaxaca – was staged at City Grit on Prince Street, which describes itself as a culinary salon. It’s the brainchild of Sarah Simmons (among Food & Wine magazine’s “America’s Greatest New Cooks”). 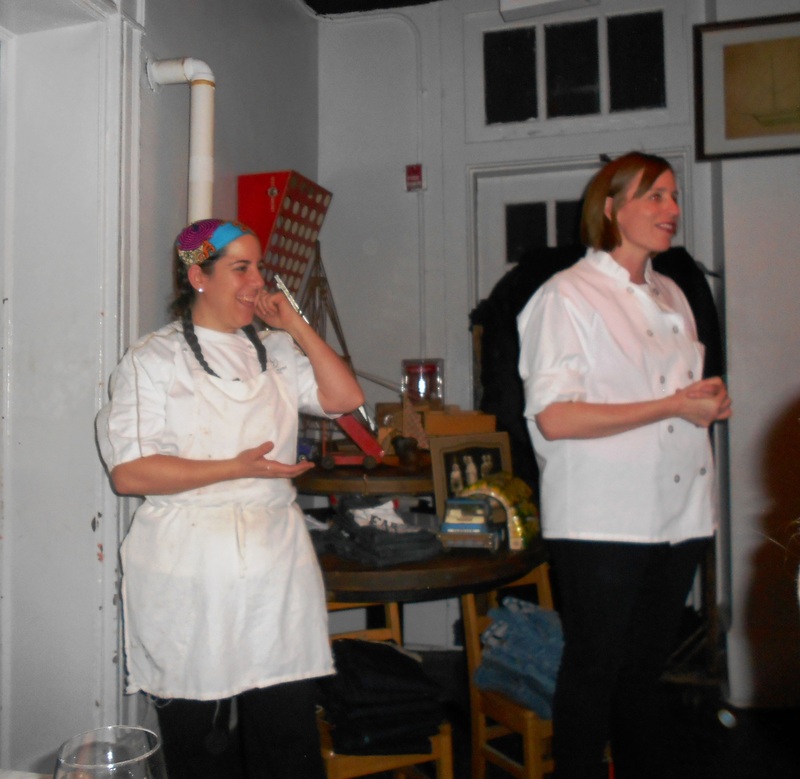 Sometimes she mounts dinners there; other times she turns the salon over to guest chefs – often from out of town, and often young and high-profile – which is why the NY Times calls City Grit a sort of Off Broadway, “scrappier” Beard House. City Grit operates evenings in the back room of what by day is WRK Design, a funky, hipsterish furniture store. Just about everything you see in the photos that follow is for sale. 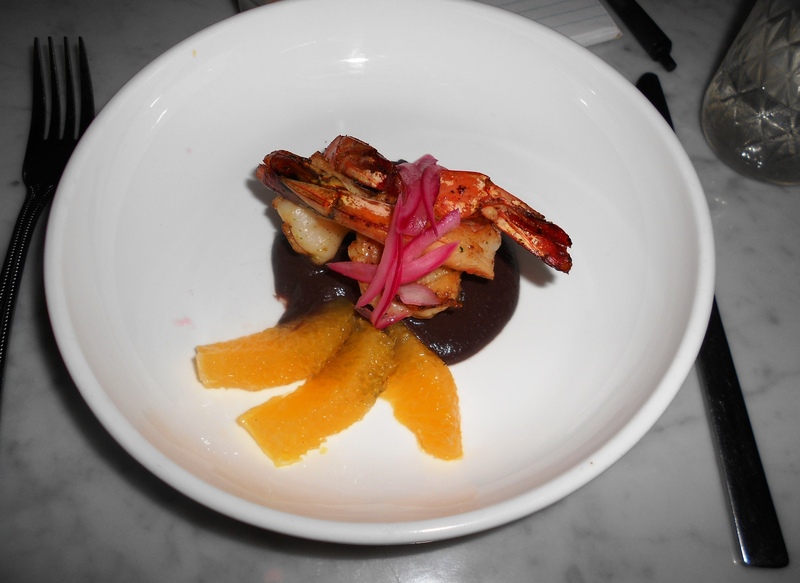 The dinner opened with antijitos – street food – that included a corn “boat” topped with sautéed crickets. Several guests had carted ingredients up from Oaxaca, among them the crickets, Oaxacan cheese, and pinole (toasted corn flour). Compared to most North Americans, my personal history of consuming insects (on purpose, as an adult) is fairly extensive. On the first occasion no less a personage than chef Bill Yosses, now at the White House, convinced me to try an oatmeal-toasted mealy worm. Then my buddy Ruth Alegria got me hooked on dried crickets, called chapulines (in their crushed form) sprinkled over guacamole and in quesadillas. The mealy worm was just OK (notice the singular “worm”). The flavor was actually good, but its squishy interior put me off. 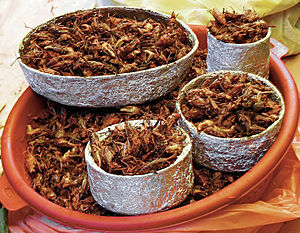 Chapulines, though, are delicious without qualification. Like potato chips they are crunchy, salty, and have a satisfying umami quality. With the impending invasion of countless hordes of 17-year cicadas about to hit the East Coast, some sources recommend eating them. They are supposedly super-high in protein and have a nutty taste. Recipes and more at cicadainvasion.blogspot.com. 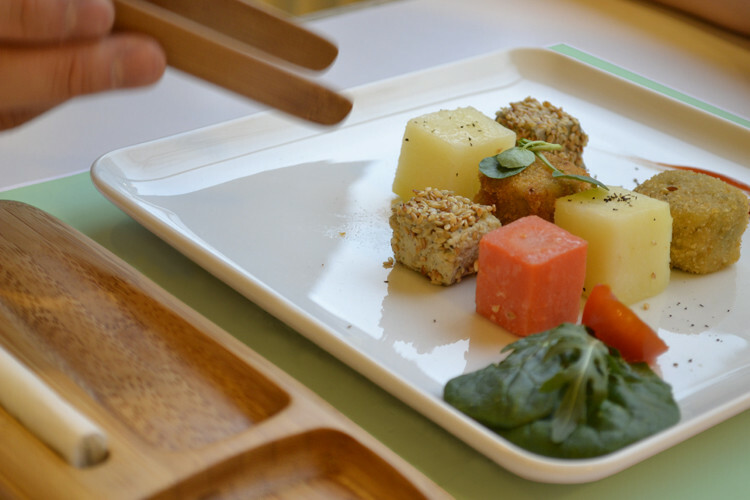 So, would you eat insects? Before you say no, check out this report from fastcoexist.com. I think these grad students may be onto something. This entry was posted in Events, Favorite Finds, Restaurants and tagged 17 year cicadas, Bill Yosses, Blu restaurant, Boulevard 572, chapulines, City Grit, Fany Gerson, fastcoexist.com, Highlawn Pavilion, Kings Cooking Studio, La Newyorkina, Mexico Soul and Essence, paletas, Rosie Saferstein, Ruth Alegria, Sarah Simmons, Satis restaurant, Suzanne Lowery, Swedesboro, Tavro 13, Tavro Thirteen, WRK Design. Bookmark the permalink. Pat, is Rosie’s class Friday, May 10th or Thursday, May 9th? Thursday, May 9th! Thanks for pointing this out; change has been made! Knowing that you do like your insects (and I witnessed that meal worm! ), have you seen these, http://chapul.com/our-delicious-cricket-bars? Enjoy!